Hypertrophy Program for Skinny Guys is a strength training program designed add muscle mass to hard-gainers and skinny guys. Muscle hypertrophy means increasing the thickness of muscle (increasing cross-section) through moderately high volume and loading. In addition to mass building upper and lower body strength exercises, the program inlcudes some work capacity training and focused core strength work. This general fitness plan will increase your bodyweight via muscle mass, while maintaining your work capacity engine. Take Saturday and Sunday completely off. Total rest. This Program requires a fully equipped gym. It can be completed in any commercial gym. 60 min. Wednesday’s session shouldn’t take longer than 45 min. Coach, I wanted to say nice job on Hypertrophy & Rat 6. *I replaced squat clean with full c/j, and hinge lift with full deads. Current weight is about 175, below 10% body fat. Planning on doing valor again next then restarting the 3 over again in order. I'm excited to write this email, because this will be the second military athlete program I have completed. The first being the Afghanistan pre deployment program. I am currently on a rest day anxious for week 4 of the Hypertrophyprogram. I have been following the meal plan and eating everything I can and can tolorate. As far as protien and peanut butter I just re supplied myself with the help of friends and family in the states. I wanted to get advice from the man himself, on what workout would be beneficial to keep gaining size and overall strength and durability. I went from 134 to 148lbs. I recently scored a 300 on a pt test here in Afghanistan about a week ago with my 2 mile time sitting surely at 11:52. I'm happy with where I'm at for running that has always been part of a weekly schedule. What program(s) though would you recommend for me, whether it be part of LEA, MA, or MA it doesnt matter to me. Im actually looking into SWAT once I leave the military this next summer. Look forward to hearing from you! I am one week away from completing my third military athlete program and am once again more than satisfied with the results. To date I have completed the body weight, skinny guy and am one week away from completing the 357 plan. I am sure you get inundated with emails so as a refresher my initial goals were to increase strength and to add some mass. I started at 158 and am now somewhere around 174 (I am 6'1" and 32 years old); so I am headed in the correct direction. I would like to eventually get back up to a weight of 190; where I was prior to training for/running a marathon a couple of years ago. I have also seen strength gains via the 357 plan and feel fitter and healthier overall. You're a busy guy; I'll try to keep it short: I'm a 5-year swat vet in Virginia and just finished the Hypertrophy Program for Skinny Guys. Great program. I'm 5'10, 36 years old. 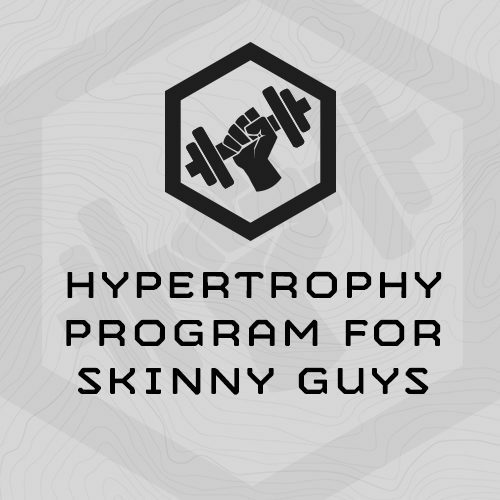 I recently used the Hypertrophy for Skinny Guys plan…it was awesome. I added 7lbs of muscle over the month and saw some strength gains along the way.